A promising name! With our mountain bikes we set off from Predazzo and take the bubble car. The liftees help us go through the turnstile and put the bikes in the bubble car. 3 bikes and 3 people will fit in a bubble car, it depends if it is adults or kids/children. During the ascent you will be left astounded by the ski jumping trampolines. How will they be able to throw themselves down at full speed from that trampoline during winter (and summer) and land on that steep hill? A mystery and a bow of admiration to those brave athletes. We reach Gardonè and on our bikes we reach the start of the chairlift a few metres further down. We get on the 4 seater chair lift, the liftee puts our bikes on (one at a time) on the chairs behind us. Here are the white rocks of Latemar which contrast with the blue sky and the green meadows. 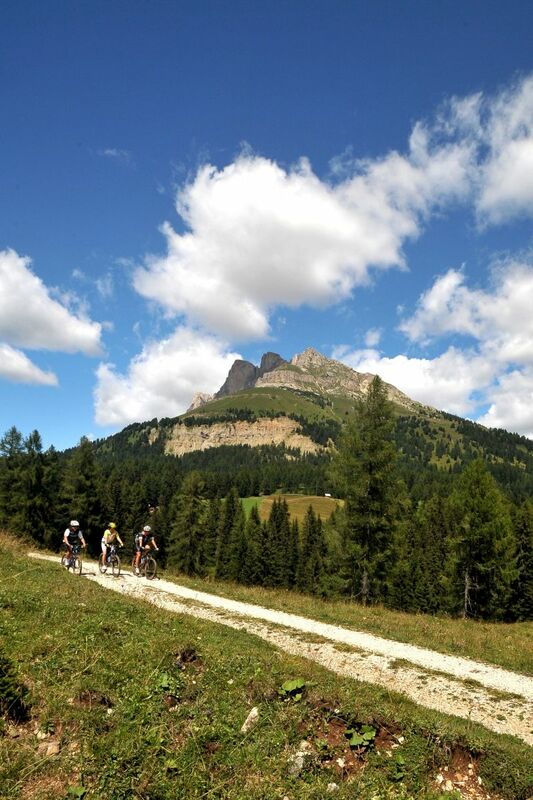 Today we will ride our bike in this mountain massif of the Dolomites. Once we reach Passo Feudo we recommend you take a break to admire the view, especially the mountains to the left, which, during the itinerary, will no longer be visible. You can see many peaks, from the Lagorai chain and the Pale di San Martino. Further over to the left you can see Pelmo and Antelao, two peaks which are situated in the region of Veneto. Just below the mountain hut there is a panoramio: a 180° photo with the names and altitudes of all the peaks which can be seen from south to west. Once you finish seeing the zig zag horizon, jump back onto the saddle, helmet on and head off on your Latemar Tour. The first downhill section is very wide, the terrain is quite difficult though, during winter this is a ski slope. Just below you need to be careful because a path crosses the route. Technically it is not difficult, but there are hikers walking uphill from Pampeago to Passo Feudo and you need to take care not to hit anyone. In a few minutes you reach Rifugio Zischg and Rifugio Ganischger. From here head onto the little asphalt road which climbs up from Pampeago. This is the final section of the long and tiring ascent of the 19th Giro d’Italia stage in 2012. Cycle along slightly uphill through wooden huts and green pastures dotted with cows, a relaxing landscape. 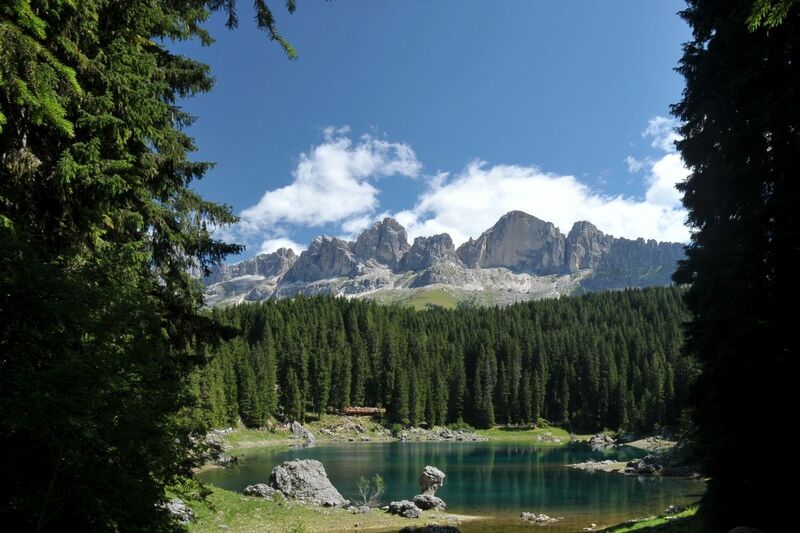 At Passo Pampeago, on the left, you will see a wooden sphere. We recommend a break. You can enter the sphere and see Latemar as you’ve never seen it before. Now another downhill section begins. This time it is easier, it is entirely on asphalt. You need to be careful of the many biped and quadruped obstacles along the way. Pass along other beautiful wooden huts and luxuriant pastures. Enter a wood of pinus cembra or swiss pine. You will feel the fresh air (lucky are those who have a delicate sense of smell) and smell the lovely forest perfume. Continue downhill and enter a tunnel which easily lets you go past a ski slope to then come out at Malga Laner. You are now in the territory of Obereggen which, with Pampeago and Predazzo during winter is part of the ski resort Ski Center Latemar. Let’s continue our descent through the woods. You will notice lamp posts along the side of the road, during winter this part of the road becomes a beautiful sledge run open even during night time 3 times a week. You will reach the hotels of Obereggen and at the junction with the main road, turn right straight away entering a wide square. Leave the big district heating building on the left and take a dirt road which through the woods leads to Bewallerhof, level with a hairpin bend of the provincial road which goes down to the town of Ega. Here a short but steep uphill section begins. The dirt surface is not very stable: less expert cyclists should get off their bike and push it. The section is very short. Once you reach the farmhouse, get back onto the bike and cycle along a beautiful forestry road for 4,5 km and among simple up and down sections, pass along meadows in bloom and then a thriving forest. Further on you will reach a section which runs along the state road, and then you will see glimpses of cobalt blue. This is the sign that you have reached the Lake of Carezza. This amazing and famous lake is one of this itinerary’s highlights. It is worth stopping to admire this amazing site. The colour of the Carezza Lake seems almost artificial, the reflection of Latemar’s spires on this surface is breath taking and will remain engrained in your memory. Once back on the saddle, we start the last uphill section which is 4.5 km long and will lead to Passo Costalunga. The itinerary now becomes more difficult, the path is covered in a few stones but you will shortly reach Carezza (part of Nova Levante commune). On the left you will see the Grand Hotel Carezza, made famous in 1897 thanks to the empress Elizabeth (Sissi) who stayed here for her summer holidays. Straight after, the building became the princess’s summer residence and the hotel’s fame spread across European borders. During the next years even Agatha Christie and Winston Churchill stayed in this hotel. If you look up you will be left speechless: the majestic Catinaccio is to say the least, impressive! You just cannot take your eyes off the peaks and vertical walls where during summer many Italian and foreign climbers tackle these ascents with rope, harnesses climbing shoes and helmets. 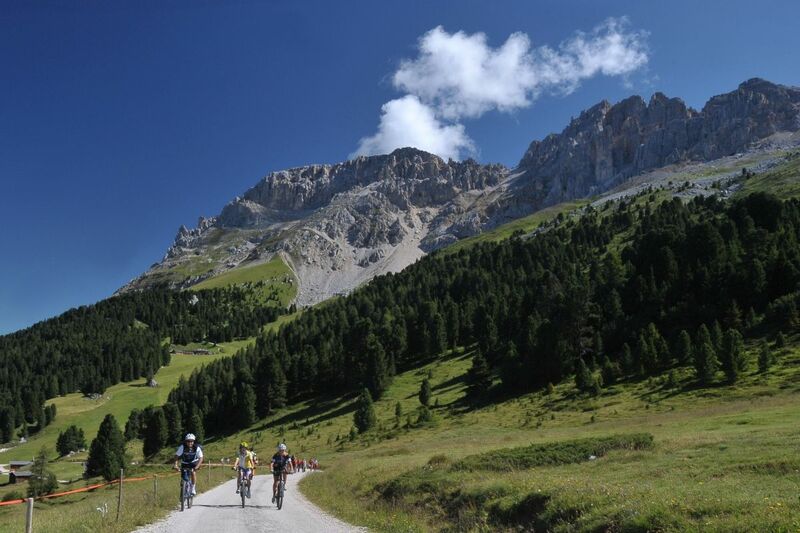 Not long to go till you reach Passo Costalunga. At this point there are two possibilities: for those who wish to cycle easily just follow the state road to the pass. On the left you will find a golf course: 9-holes made at the end of the 19th century for the élite on holiday at the Grand Hotel Carezza. For those who still have some energy left tackle the easy ascent along the forestry road which goes by the artificial lake used for making artificial snow, on the right. Cross the little bridge which runs over a stream and then tackle a short section with mud, stones and roots, which is quite difficult. We recommend you get off your bike and push it. Once back on the saddle reach a hotel built in stone, from where, in a few minutes, you reach Passo Costalunga with its 1.745 metres of altitude. Here you can take a well deserved lunch, there is a wide choice of restaurants. 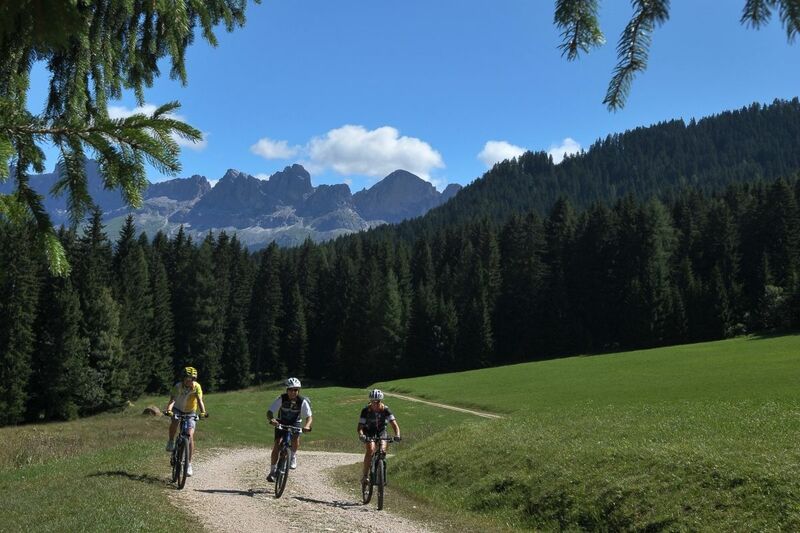 After resting your body and restoring your spirit with the delicacies of South Tyrolean cuisine you can get back onto your mountain bikes and start the last descent (8 km) of your tour. Ride along the state road for a few metres and turn onto a little road, on the right, which runs along meadows and leads to the farmhouse called Secine. Continue downhill, now along a dirt road, through pastures and go through the woods. Continue downhill with a few steep sections, until on the right, we will find Malga Roncac. We are now out of the vegetation and continue the descent through the meadows . The road becomes asphalt and we enter the town of Moena. At Moena, head down till you are in front of a fountain, go past it and you reach traffic lights which regulate traffic along a short narrow section with a blind turn. Cross the bridge and continue straight along the road following signposts for the cycling path. Pass above the church, through the fields then the road goes down towards the commercial area. Once the downhill section has ended turn right straight away and reach the sports fields. Here cross the state road to join, once again, the state road which runs along the Avisio torrent for 6 km to then reach the bubble car and the starting point.